When teaching structural analysis, some contend that students need broad exposure to many of the classical techniques of analysis, while others argue that learners benefit more from the computer-based analysis experiences that involve parametric studies. Structural Analysis, Understanding Behavior strikes a balance between these viewpoints. Students may no longer need to know every classical technique but they still need a fundamental knowledge of the concepts which come from studying a subset of classical techniques. This foundation is then strengthened by the use of structural analysis software in activities designed to promite self-discovery of structural concepts and behaviors. This text was developed with this goal in mind. Bryant G. Nielson is the Cottingham Distinguished Professor of Practice in the Glenn Department of Civil Engineering at Clemson University. He holds a BS and MS in civil engineering from Utah State University and a PhD in civil engineering from the Georgia Institute of Technology. Professor Nielson is an educator at heart. He is the recipient of numerous teaching awards and has been actively engaged in teaching structural analysis and other related courses for over a decade – in both traditional and online settings. He has also worked for several years as a structural designer which has provided context and direction for teaching the discipline of structural engineering to the engineers of the future. The foundation for the current textbook is the 4th Edition of Jack C. McCormac’s notable text titled: Structural Analysis: Using Classical and Matrix Methods. However, over a five year period, the authors have thoroughly reworked the content, format, layout and emphasis. Feedback from many practicing engineers helped determine which topics were retained or removed. Many classical techniques, such as slope-deflection, that are not widely used today have been removed altogether from the text. Some classical techniques, such as moment distribution, which are still referenced in today’s design codes, have been left in. A new chapter has been added dealing with the lateral load path in a building and its relevant components - a topic for which many graduating students find themselves ill prepared. Problem sets available within the textbook have been greatly expanded and altered from earlier versions of the text. The chapters on the matrix-based stiffness approach have been expanded yet streamlined to introduce the basic method and also address special topics that are suitable for a class in matrix structural analysis. These demonstrate the use of spreadsheets in the implementation of this approach. Margin notes have been added to highlight key concepts throughout the text, point out trouble spots and provide clarifying remarks. These notes often reflect feedback from students and address questions they commonly ask. 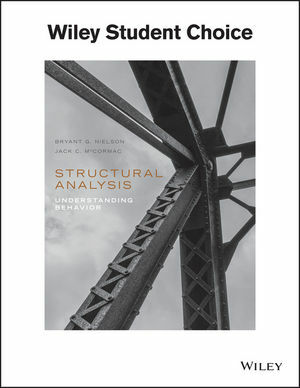 Most chapters within this textbook have a section devoted to the use of computer software including the commercially available structural analysis software SAP2000. A tutorial video on how to use SAP2000 provides a basic introduction to the tools and modeling process required to complete the modeling exercises contained in this text. Spreadsheets are introduced for handling some analysis calculations. Parametric exercises are provided as part of most problem sets to let students discover the influence that various modeling parameters have upon the response of structures. The authors believe that a well-rounded problem set includes both hand-work and computer work. Video examples for each chapter have been developed to demonstrate the processes presented in the text.